This guide contains step-by-step instructions on how to create, configure and run a cold email campaign in Woodpecker. Once your campaign is created, open it (click “Campaigns” in the black bar at the top, then click your campaign), and click “Connect your email”, right below the campaign's name. Alternatively, you can go to Settings (expand the menu in the upper right and click “Settings”), then click the green “Add Email Account” button. Choose “Automatic integration” and the App will auto-detect settings and quickly configure the email for you. If you are using a third-party app for sending (such as Mailgun or Sendgrid), or would simply like to configure your email yourself, select “Advanced”. Check Email Account: Advanced setup to learn more. 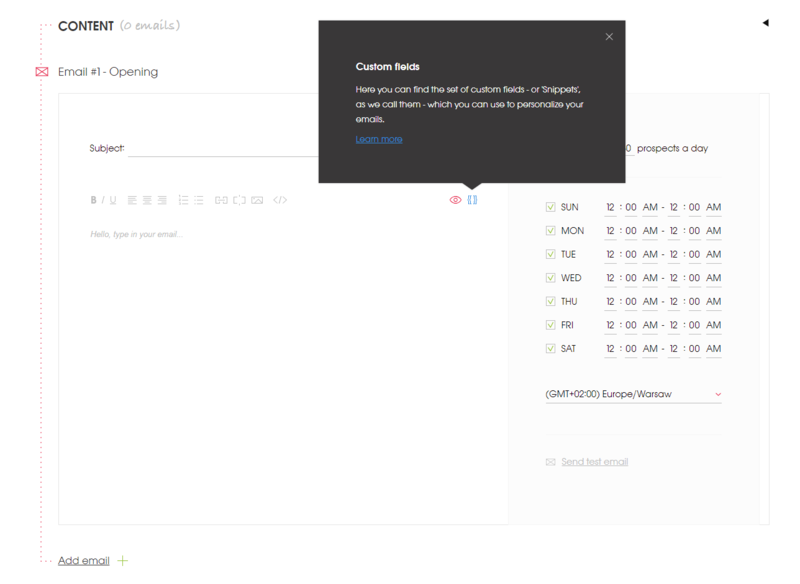 This screen allows you to set the sender's name that will be visible to your recipients, and a signature that will be attached to emails in your campaigns. You can skip this step, and set both later by clicking “set it later in Settings”. … and give Woodpecker a few moments to complete the setup. Afterwards, you will be able to select this email as a sender in your campaign. Alternatively, if you connected your email through Settings menu, you can now select it in your campaign. Just go to “Campaigns” list, open the campaign and select the newly connected address in “Send from”. You can type in the content of your message right here, in the editor, or paste it from a plain text editor, such as Notepad or TextEdit. Make sure that you're not copying formatted text from editors such as Word, as it might cause your email to not render properly in your prospect's inbox. For copying and pasting formatted text, paste it into Notepad/TextEdit first (to remove formatting), and copy it again from there, then paste it into Woodpecker's editor. 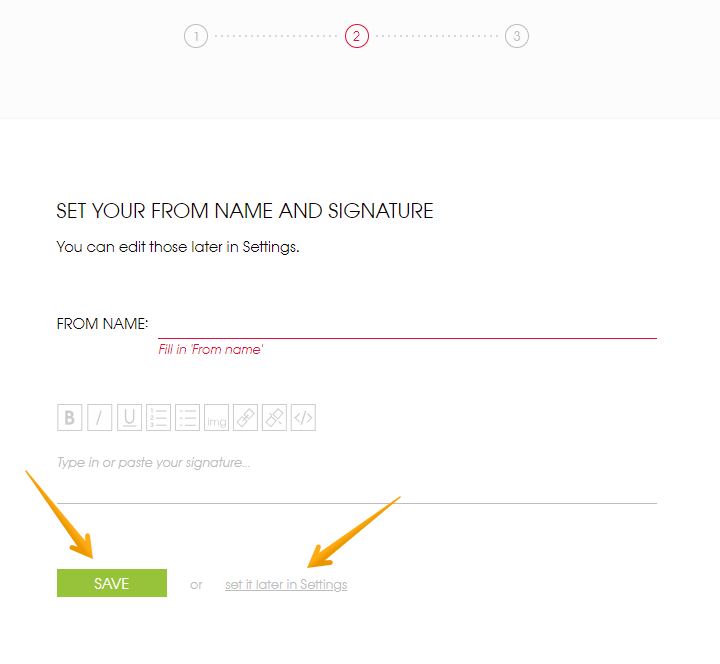 Always use the green personalization buttons, available in the panel on the right. They are called snippets, and their task is to insert information specific to your prospect into your email. This information can include first name, company or website, and is used in individual messages, making each of them unique and much more interesting to your prospects. You can follow up with the prospects who have not responded to your email. To create a follow-up message, click “Add email” right below the editor that contains your first message. Just like with the first email, you can compose the follow-up message in the editor, and personalize it with snippets. You can create up to 8 messages in a sequence within a single campaign (an opening email and up to 7 follow-ups). Once you composed your cold email campaign, you can set the Delivery Time for all emails. 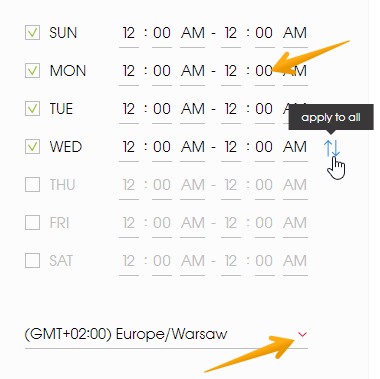 You can also change the default Daily Limit for the opening emails, and add delay time for the follow-ups. Set the maximum of opening emails (Email #1) that you want to be sent a day. The default is 50 opening emails a day, but you may want to send fewer or more than that. The limit is capped at 500. The Daily limit's recommended value is 100-150. Remember that you'll be sending these emails from your own mailbox, and there are sending limits established by your email provider. Your campaigns must be set up so that these limits are not exceeded. For each of your follow-ups, set the number of days to wait before sending. This always relates to the time the previous email was sent (for each prospect). select the time zone that is relevant to your prospects. If you want to send your emails before noon, set the time frame to, for example, 7 AM – 11 AM. If you don’t want any emails to be sent on weekends, uncheck Sat and Sun. A) Manually – if you'd like to add just a few prospects. Click “Add prospects”, on the right, and select “Manually”. In the table that appears, in the first column, type in the prospect’s email address (required). Hit [Enter] to add another. Fill the other fields with the information you want to use (First name, Last name, etc.). Click “Add” to add these prospects to your campaign. 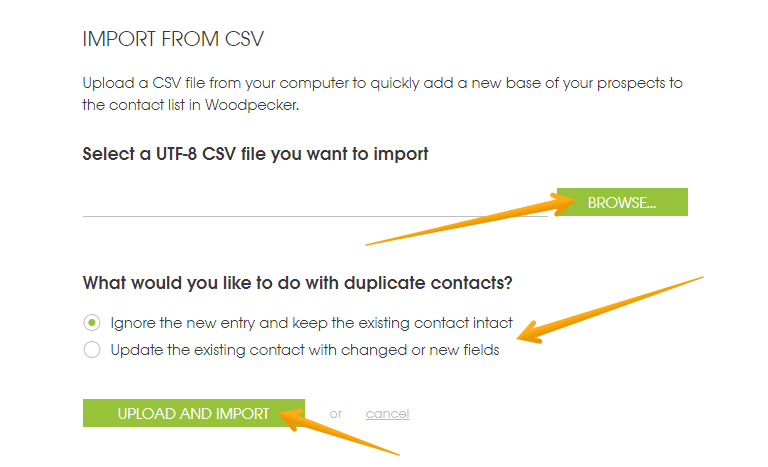 B) Import – if you have a long list of prospects, collected in a spreadsheet (CSV) file. Prepare your spreadsheet. It should contain at least a column with email addresses. 1. 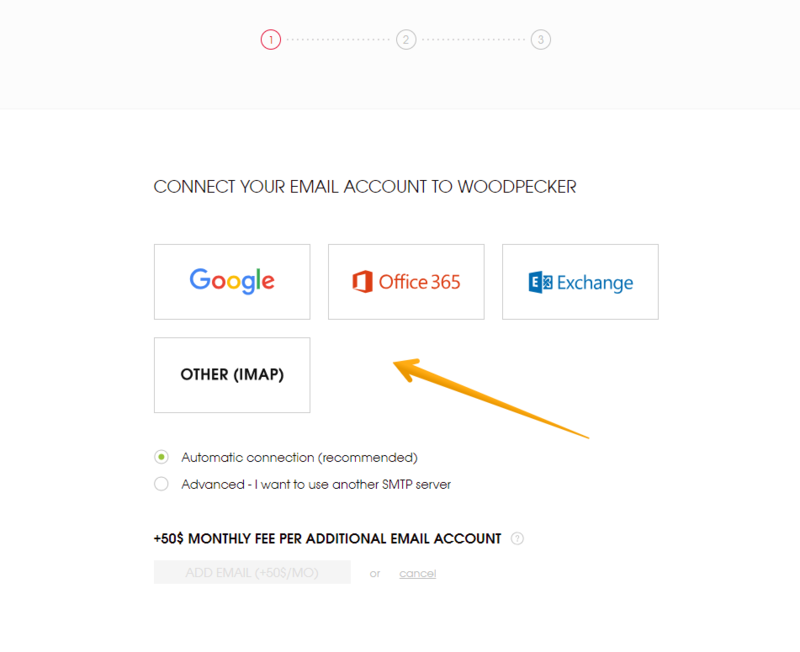 There should also be some columns that will correspond to fields in Woodpecker (such as First Name, Company or Website); this is not required but recommended – the better the database, the greater your options for personalizing your emails. Next, save your spreadsheet to file in CSV format (when saving, make sure you have UTF-8 encoding selected). Here's our CSV guide, please have a look! Back in Woodpecker, click “Add prospects” on the right, and select “Import”. In the new screen, click “Browse…”, and select your file, then click “Upload and Import”. In the next screen, map Woodpecker fields to those in your spreadsheet. Any unmapped fields will not be imported. If the first row contains column headers, check “Ignore the first row when importing”, right below. When this is done, click “Import”. send a test email to your own address (click “Send Test Email”) – the whole sequence of emails from your campaign, containing example data, will be sent to your own address. 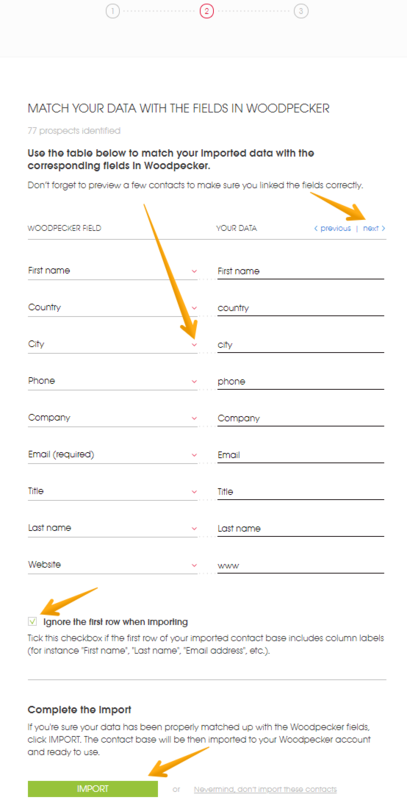 C) From database – you can select individual prospects from your database in Woodpecker, once it is populated. Click “Add prospects”, on the right, and select “From database”. Select any prospects you previously uploaded, and click “Add” to add them to your campaign. Click “Preview”, and you'll be able to take a look at your emails and check what they will look like once they are sent. Click “Send test email”, and the whole sequence of emails from your campaign, containing example data, will be sent to your own address – you can check them all in your own inbox. Click “Save as draft” if you just want to save the campaign as a draft, and don't want to start it yet. If everything looks okay, and you want to start your campaign pronto, click the green “Save & Send” button at the bottom. Your campaign will now be running and sending emails according to your settings. Remember that you can edit your campaign at any later time, to add prospects or change the message content. To do that, open it and click “Edit“ in the upper-right corner. You can click “Add prospects” to quickly add new prospects to that campaign. To view or edit the list of all campaigns that you created (both the drafts and running campaigns), click Campaigns at the top.